Rhubarb is a cultivated plant in the genus Rheum in the family Polygonaceae. It is a herbaceous perennial growing from short, thick rhizomes. Historically, different plants have been called "rhubarb" in English and used for two distinct purposes. The roots of some species were first used in medicine. Later, the fleshy, edible stalks (petioles) of other species and hybrids (culinary rhubarb) were cooked and used for food. The large, triangular leaves contain high levels of oxalic acid, making them inedible. The small flowers are grouped in large compound leafy greenish-white to rose-red inflorescences. For other uses, see Rhubarb (disambiguation). The precise origin of culinary rhubarb is unknown. The species Rheum rhabarbarum (syn. R. undulatum) and R. rhaponticum were grown in Europe before the 18th century and used for medicinal purposes. By the early 18th century, these two species and a possible hybrid of unknown origin, R. × hybridum, were grown as vegetable crops in England and Scandinavia. They readily hybridize, and culinary rhubarb was developed by selecting open-pollinated seed, so that its precise origin is almost impossible to determine. 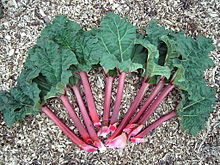 In appearance, culinary rhubarb varies continuously between R. rhaponticum and R. rhabarbarum. However, modern rhubarb cultivars are tetraploids with 2n = 44, in contrast to 2n=22 for the wild species. Although rhubarb is a vegetable, it is often put to the same culinary uses as fruits. The leaf stalks can be used raw, when they have a crisp texture (similar to celery, although it is in a different family), but are most commonly cooked with sugar and used in pies, crumbles and other desserts. They have a strong, tart taste. Many cultivars have been developed for human consumption, most of which are recognised as Rheum × hybridum by the Royal Horticultural Society. Rhubarb is grown widely, and with greenhouse production it is available throughout much of the year. Rhubarb grown in hothouses (heated greenhouses) is called "hothouse rhubarb", and is typically made available at consumer markets in early spring, before outdoor cultivated rhubarb is available. Hothouse rhubarb is usually brighter red, tenderer and sweeter-tasting than outdoor rhubarb. In temperate climates, rhubarb is one of the first food plants harvested, usually in mid- to late spring (April or May in the Northern Hemisphere, October or November in the Southern Hemisphere), and the season for field-grown plants lasts until the end of summer. In the northwestern US states of Oregon and Washington, there are typically two harvests, from late April to May and from late June into July; half of all US production is in Pierce County, Washington. Rhubarb is ready to consume as soon as harvested, and freshly cut stalks are firm and glossy. In the United Kingdom, the first rhubarb of the year is harvested by candlelight in forcing sheds where all other light is excluded, a practice that produces a sweeter, more tender stalk. These sheds are dotted around the "Rhubarb Triangle" between Wakefield, Leeds, and Morley. The Chinese call rhubarb "the great yellow" (dà huáng 大黃), and have used rhubarb root for medicinal purposes for thousands of years. It appears in The Divine Farmer's Herb-Root Classic which is thought to have been compiled about 1,800 years ago. Though Dioscurides' description of ρηον or ρά indicates that a medicinal root brought to Greece from beyond the Bosphorus may have been rhubarb, commerce in the drug did not become securely established until Islamic times. During Islamic times, it was imported along the Silk Road, reaching Europe in the 14th century through the ports of Aleppo and Smyrna, where it became known as "Turkish rhubarb". Later, it also started arriving via the new maritime routes, or overland through Russia. The "Russian rhubarb" was the most valued, probably because of the rhubarb-specific quality control system maintained by the Russian Empire. The high price as well as the increasing demand from apothecaries stimulated efforts to cultivate the different species of rhubarb on European soil. Certain species came to be grown in England to produce the roots. The local availability of the plants grown for medicinal purposes, together with the increasing abundance and decreasing price of sugar in the 18th century, galvanised its culinary adoption. Grieve claims a date of 1820 in England. Though it is often asserted that rhubarb first came to the United States in the 1820s, John Bartram was growing medicinal and culinary rhubarbs in Philadelphia from the 1730s, planting seeds sent him by Peter Collinson. From the first, the familiar garden rhubarb was not the only Rheum in American gardens: Thomas Jefferson planted R. undulatum at Monticello in 1809 and 1811, observing that it was "Esculent rhubarb, the leaves excellent as Spinach." "Rhubarb" originally comes from the two Greek words for rhubarb. Rheon from the Persian rewend, later became the Latin word rheum, meaning rhubarb. The other Greek word is rha, an ancient name for the Volga River in Russian, where rhubarb was cultivated, having been introduced there from China via the Silk Road. In medieval Latin, rheon and rha became rheum barbarum, literally "foreign rhubarb" or "strange rhubarb", and evolved later into rheubarbarum. Most likely, the English word "rhubarb" entered the language via the French word rhubarbe brought over by the conquering Normans and from the Latin rheubarbarum. Rhubarb is grown primarily for its fleshy leafstalks, technically known as petioles. The use of rhubarb stalks as food is a relatively recent innovation. This usage was first recorded in 18th to 19th-century England after affordable sugar became more widely available. Commonly, it is stewed with sugar or used in pies and desserts, but it can also be put into savoury dishes or pickled. Rhubarb can be dehydrated and infused with fruit juice. In the United States, it is usually infused with strawberry juice to mimic the there popular strawberry rhubarb pie. The species Rheum ribes has been eaten in the Islamic world since the 10th century. In the United States the stalks are often cut into small pieces and stewed (boiled in water) with added sugar, until soft. Little water is added, as rhubarb stalks already contain a great deal of water. Rhubarb should be processed and stored in containers which are unaffected by residual acid content, such as glass or stainless steel. Spices such as cinnamon, nutmeg, and ginger are sometimes added. Stewed rhubarb or rhubarb sauce, like applesauce, is usually eaten cold. Pectin, or sugar with pectin, can be added to the mixture to make jams. 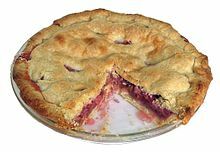 A similar local preparation, thickened with cornstarch or flour, is used as filling for rhubarb pie, tarts, and crumbles, leading to the US nickname "pie plant", by which it is referred to in many 19th-century US cookbooks, as well as by American author Laura Ingalls Wilder in her short novel The First Four Years. In recent times rhubarb has often been paired with strawberries in the US to make strawberry-rhubarb pie, though some rhubarb purists jokingly consider this "a rather unhappy marriage". In former days, a common and affordable sweet for children in parts of the United Kingdom and Sweden was a tender stick of rhubarb, dipped in sugar. It is still eaten this way in western Finland, Norway, Canada, Iceland, the Faroe Islands and Sweden, and also some other parts of the world. In Chile, Chilean rhubarb, which is completely unrelated, is sold on the street with salt or dried chili pepper. Rhubarb can be used to make a fruit wine or sima. It is also used to make compote. Being a bit sour, it is very refreshing and can be drunk cold, especially during the summer. In traditional Chinese medicine, rhubarb roots of a number of species have been thought of as a laxative for several millennia. Rhubarb also appears in medieval Arabic and European prescriptions. It was one of the first Chinese medicines to be imported to the West from China. The roots and stems are rich in anthraquinones, such as emodin and rhein. These substances are cathartic and laxative, explaining the sporadic use of rhubarb as a dieting aid. The anthraquinone compounds have been separated from powdered rhubarb root for medicinal purposes. The rhizomes contain stilbenoid compounds (including rhaponticin), which seem to lower blood glucose levels in diabetic mice. Rhubarb also contains the flavanol glucosides (+)-catechin-5-O-glucoside and (−)-catechin-7-O-glucoside. Rhubarb contains quinone molecules which are capable of carrying an electrical charge. In 2014, a Harvard-based team of scientists published results describing the use of the quinone AQDS, almost identical to a form found in rhubarb, in flow-batteries. Rhubarb leaves contain poisonous substances, including oxalic acid, which is a nephrotoxic acid that is present in many plants. Humans have been poisoned after ingesting the leaves, a particular problem during World War I when the leaves were mistakenly recommended as a food source in Britain. 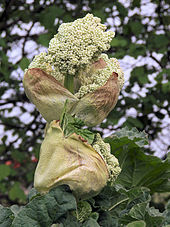 The toxic rhubarb leaves have been used in flavouring extracts, after the oxalic acid is removed by treatment with precipitated chalk (i.e., calcium carbonate). The LD50 (median lethal dose) for pure oxalic acid in rats is about 375 mg/kg body weight, or about 25 grams for a 65-kilogram (143 lb) human. Other sources give a much higher oral LDLo (lowest published lethal dose) of 600 mg/kg. While the oxalic acid content of rhubarb leaves can vary, a typical value is about 0.5%,  meaning a 65 kg adult would need to eat 4 to 8 kg (9 to 18 lbs) to obtain a lethal dose, depending on which lethal dose is assumed. Cooking the leaves with baking soda can make them more poisonous by producing soluble oxalates. The leaves are believed to also contain an additional, unidentified toxin, which might be an anthraquinone glycoside (also known as senna glycosides). In the petioles (leaf stalks), the proportion of oxalic acid is much lower, only about a tenth of the total acidity of 2–2.5%, which consists mostly of malic acid. Serious cases of rhubarb poisoning are not well documented in modern medical publications. It is thought that both fatal and non-fatal cases of rhubarb poisoning have not been caused by oxalates, but rather by toxic anthraquinone glycosides. Such cases of rhubarb poisoning do not feature the corrosive gastroenteritis that accompanies ingestion of high levels of oxalic acid. The rhubarb curculio, Lixus concavus, is a weevil. Rhubarb is a host, damage being visible mainly on the leaves and stalks, with gummosis, and oval or circular feeding and/or egg-laying sites. Hungry wildlife may dig up and eat rhubarb roots in the spring, as stored starches are turned to sugars for new foliage growth. ^ "Rheum × hybridum Murray". Plants of the World Online. Royal Botanic Gardens, Kew. Retrieved 2019-03-10. ^ Tanhuanpää, Pirjo; Suojala-Ahlfors, Terhi & Hartikainen, Merja (2019). "Genetic diversity of Finnish home garden rhubarbs (Rheum spp.) assessed by simple sequence repeat markers". Genetic Resources and Crop Evolution. 66 (1): 17–25. doi:10.1007/s10722-018-0692-8. ^ Libert, Bo & Englund, Roger (1989). "Present Distribution and Ecology of Rheum rhaponticum (Polygonaceae)". Willdenowia. 19 (1): 91–98. JSTOR 3996925. ^ Hood, Karen Jean Matsko. 2011. Rhubarb Delights Cookbook: a Collection of Rhubarb Recipes. Spokane Valley, WA: Whispering Pine Press International, Inc. pp. 20, 22. ISBN 9781930948006. ^ "RHS Plantfinder - Rhubarb". Retrieved 23 September 2018. ^ "Pierce County Agriculture". 2009-07-31. Retrieved 2018-07-30. ^ Wakefield Metropolitan District Council. "Rhubarb". Archived from the original on 2008-09-30. Retrieved 2006-03-12. ^ "Growing Rhubarb in the Home Garden". Ohio State University Extension Fact Sheet. Archived from the original on June 5, 2013. Retrieved June 4, 2013. ^ "Rhubarb Varieties". Rhubarbinfo.com. 2004-09-01. Retrieved 2010-03-05. ^ a b praful akolkar. "Pharmacognosy of Rhubarb". PharmaXChange.info. ^ a b John Uri Lloyd (1921). Origin and History of All the Pharmacopeial Vegetable Drugs, Chemicals and Origin and History of All the Pharmacopeial Vegetable Drugs, Chemicals and Preparations with Bibliography. 1. ISBN 978-1-4086-8990-5. ^ Warmington, E. H. (1928). The Commerce Between the Roman Empire and India. Cambridge: Cambridge University Press. p. 207ff. ISBN 978-1-00-136124-6. ^ a b c d Monahan, Erika (2013). "Locating rhubarb". In Findlen, Paula (ed.). Early modern things: objects and their histories, 1500-1800. Abingdon: Routledge. pp. 227–251. ISBN 978-0-415-52051-5. ^ Quoted in Frances Wood, The Silk Road: two thousand years in the heart of Asia, 2002:13f. ^ Peter Fry, "Did John Bartram introduce rhubarb to North America?" ^ "AGM Plants - Ornamental" (PDF). Royal Horticultural Society. July 2017. p. 84. Retrieved 27 September 2018. ^ "RHS Plantfinder - Rheum × hybridum 'Grandad's Favourite'". Retrieved 23 September 2018. ^ "RHS Plantfinder - Rheum × hybridum 'Reed's Early Superb'". Retrieved 23 September 2018. ^ "RHS Plantfinder - Rheum × hybridum 'Stein's Champagne'". Retrieved 23 September 2018. ^ "RHS Plantfinder - Rheum × hybridum 'Timperley Early'". Retrieved 23 September 2018. ^ Dunstone, Denis (2014). Why is an Apple a Pomme? A Journey with Words. Lulu Publishing Services. ISBN 1483418596. ^ a b Bill Neal, "Biscuits, Spoonbread and Sweet Potato Pie", p. 308 (Chapel Hill, NC: University of North Carolina Press, 2003; originally published in a different edition in 1990). ^ a b Barceloux, Donald G (7 March 2012). Medical Toxicology of Natural Substances: Foods, Fungi, Medicinal Herbs, Plants, and Venomous Animals. John Wiley & Sons. p. 235. ISBN 978-1-118-38276-9. Retrieved 5 August 2013. ^ Chen J, et al. (April 2009). "Rhaponticin from rhubarb rhizomes alleviates liver steatosis and improves blood glucose and lipid profiles in KK/Ay diabetic mice". Planta Med. 75: 472–7. doi:10.1055/s-0029-1185304. PMID 19235684. ^ Huskinson, B; Marshak, MP; Suh, C; et al. (9 January 2014). "A metal-free organic-inorganic aqueous flow battery" (PDF). Nature. 505 (7482): 195–198. doi:10.1038/nature12909. PMID 24402280. ^ Spross, Jeff. "How A New Rhubarb-Based Battery Could Massively Increase Renewable Energy Use". Thinkprogress. Retrieved 5 December 2014. ^ Robb, H. F. (1919). "Death from rhubarb leaves due to oxalic acid poisoning". J. Am. Med. Assoc. 73: 627–628. doi:10.1001/jama.1919.02610340059028. ^ Cooper, M. R., Johnson, A. W. 1984. "Poisonous plants in Britain and their effects on animals and man." Her Majesty's Stationery Office, London, England. ^ "Rhubarb poisoning on rhubarbinfo.com". ^ Safety Officer in Physical Chemistry (August 13, 2005). "Safety (MSDS) data for oxalic acid dihydrate". Oxford University. Retrieved December 30, 2009. ^ "Rhubarb leaves poisoning". Medline Plus Medical Encyclopedia. ^ "Canadian Poisonous Plants Information System". Cbif.gc.ca. 2009-09-01. Archived from the original on 2009-01-22. Retrieved 2010-03-05. ^ a b Barceloux, DG (June 2009). "Rhubarb and oxalosis (Rheum species)". Disease-a-month : DM. 55 (6): 403–11. doi:10.1016/j.disamonth.2009.03.011. PMID 19446684. ^ a b Noonan, SC; Savage, GP (March 1999). "Oxalate content of foods and its effect on humans" (PDF). Asia Pacific journal of clinical nutrition. 8 (1): 64–74. PMID 24393738. ^ "Extension & Public Outreach" (PDF). cornell.edu. Bland, Reginald. Winter rhubarb, culture and marketing, 1915. Foust, Clifford M. (1992). Rhubarb: the wondrous drug. Princeton University Press. ISBN 978-0-691-08747-4. Chisholm, Hugh, ed. (1911). "Rhubarb" . Encyclopædia Britannica (11th ed.). Cambridge University Press.